A power plant located in Texas was experiencing numerous problems in their #3 Boiler. The furnace of the #3 Boiler is comprised of approximately 24,000 linear feet of 2.5” OD, 0.203″ and 0.300”; nominal wall thickness smooth bore carbon steel water wall tubing. The unit was experiencing tube failures due to I.D. pitting, corrosion cells, and hydrogen damage. Many destructive samples verified both the location and severity of several defects initially found with the Low Frequency Electromagnetic Technique (LFET) developed by TesTex, Inc.
Due to the general configuration of boilers, the only feasible and productive manner in which a complete inspection could be performed, would be an O.D. tube scanning method conducted from inside the furnace. Therefore, TesTex’s TS2000 Tube Scanning System proved ideal for this particular situation. There have been issues with this unit for several years. The unit was blowing tubes on a weekly basis in 2004. 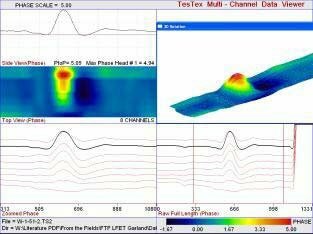 In November 2004, TesTex inspected the water walls with our LFET system and found over 300 defects. Repairs were made and the unit ran without incident for three months. Then, the water walls started having tube leaks again. 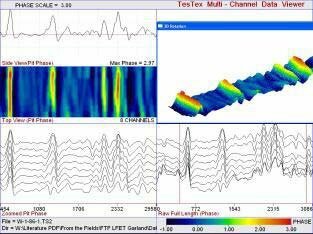 TesTex came in again in April 2005and inspected the water wall. We found over 100 new flaws and repairs were made. Again, the unit ran for about three months with no problems. After the three months, tube leaks started to occur again. These tube leaks made the plant question the inspection. TesTex strongly advised the plant that the root cause mechanisms were not solved and that the ID deposits, corrosion cells and hydrogen damage would regenerate. The plant decided to use two different technologies to inspect the tubing during their September 2005 outage. The two technologies used were the B & W EMAT system and the TesTex LFET system. The EMAT inspection was performed first. TesTex, Inc. came in afterwards and utilized their TS-2000 Tube Scanning System in which each scanner is perfectly contoured to the 2.5” O.D. of the water wall tubes for maximum sensitivity. TesTex, Inc. was able to complete the entire inspection of the #3 Boiler within 3 ½ days. The first inspection company found approximately 100-120 flaws using B & W’s EMAT inspection system. TesTex still managed to isolate an additional 130 flaws. Therefore, TesTex was able to find all flaws previously found by the competitor including an additional 130+ flaws, which the competitor was unable to find during their inspection. The flaws found by TesTex, Inc. included general wall loss, pitting at various spots of the tubes and also near buttwelds, I.D. corrosion cells, and hydrogen damage. Many of the additional flaws found by TesTex, Inc. were just inches from other indications marked by our competitor. During this recent outage, TesTex was able to conduct a condenser inspection also. The condenser tubes proved to be in poor condition. The plant is now retubing the condenser, which should go a long way towards stopping the regeneration of ID deposits, corrosion cells, and hydrogen damage. Sample waveforms of two flaw indications found by TesTex, Inc. using the TS2000 Tube Scanning System in the #3 Boiler are depicted below along with a brief description of each. The TesTex developed LFET Scanners are able to inspect the hot side of the tube with one quick pass of the scanner. The use of this system requires that the O.D. tube surface is smooth. A highpressure water blast is usually quite sufficient for coal burning boilers in regards to surface preparation. Gas burning boilers typically require very little surface preparation.